I’ve just participated in a magnificent weekend in Brisbane at the 3rd Annual Australian Romance Readers Association convention. I wasn’t sure what to expect as this was the first readers event I’ve attended. Over the coming weeks I’ll outline my impressions of this wonderful gathering which packed so much into two days and two nights. As a quick overview of the event, the weekend started with Lady Jane’s Salon where several authors read excerpts from their recent releases. Following this, delelgates attended a welcome reception which was a wonderful chance to catch up with author and publishing industry mates and meet new readers. Over the two days of conference, attendees were treated to no less than three key note speakers and numerous workshop sessions including ample opportunities for readers to ask questions of authors. I have to say that the authors I listened to were very generous and open in their answers. It was lovely to meet devoted readers who have an intimate knowledge of the romance genre, not to mention many other genres. All subgenres of romance were covered over the weekend including erotica, fantasy and sci-fi, rural, suspense and of course contemporary and category romance. By far the most amazing part of the weekend was the chance to hold my book. Yes! 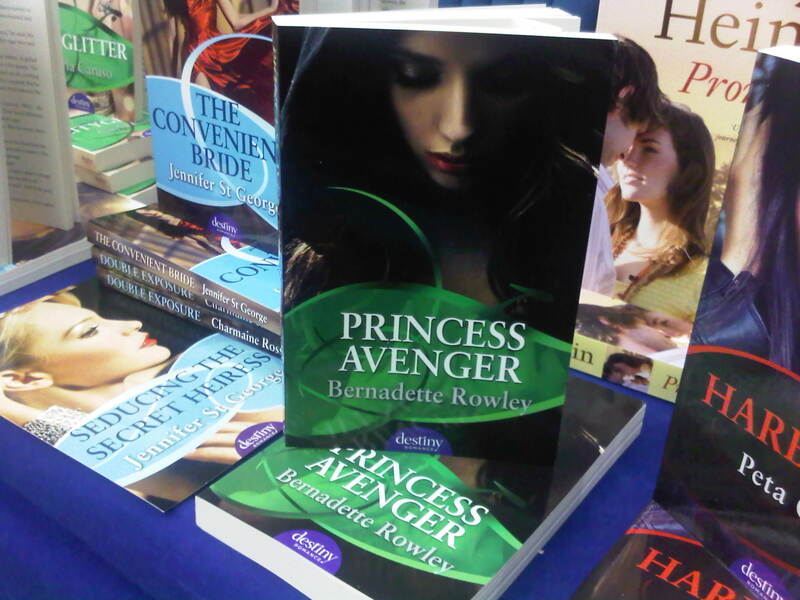 Princess Avenger has been printed along with all Destiny titles from 2012. I’ll have more info on where you’ll be able to pick up your paperback copy of my story in coming weeks. At this stage it will only be available in Australia. If you ever get a chance to attend one of these conventions either as a reader or a writer, I can thoroughly recommend it. The next one will be in two years time. Agree Bernadette that ARRC was a complete blast!!! So lovely to catch up with you! Lovely to spend some time with you too Jen. Loved seeing your book in print! And even better seeing you in person this weekend. Its been too long! So excited for your book to circulate in print – and like you I loved ARRC and would recommend it to anyone to attend who is interested in romance books of any kind. I have to admit I had never imagined there were people out there who read 70 books a month and who’s appetite for simply reading was so huge! Take care in the new bout of rain coming your way – stay dry!